That's right,it's basically a Story Mode i have made with custom goals,and i want to share it with you all,if that's what you're wondering.In this post i will explain everything on how to properly play it,besides giving you the link to it. Unfortunately,i have spent a lot more time making this than i thought i would.I lost interest in the middle of the way,and then i came back again,resulting in 2 years of delay.It shouldn't have taken that much time for a project that ended up pretty primitive.I am a bit unsettled because it didn't end up exactly how i wanted it to,but i am glad that i finally finished it and you'll be able to play it,so i hope you all enjoy! Please pay close attention to what's written here,for you to understand the story properly. 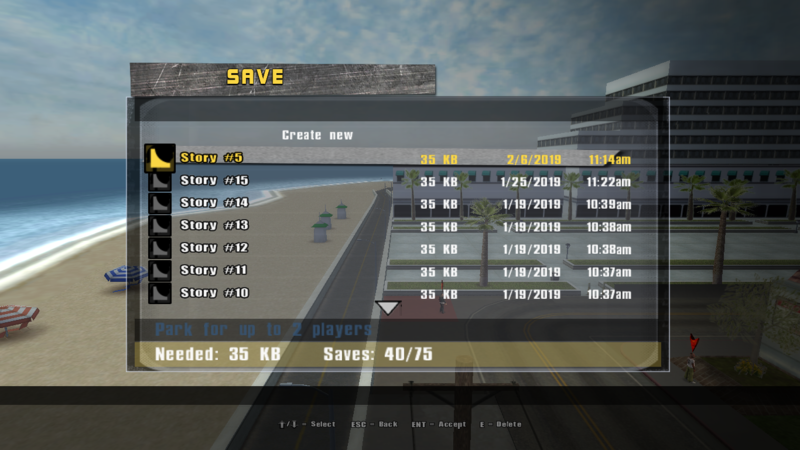 Once you download everything,paste all the .PRK files in the "Save" folder.You will notice a folder named "Skater's Journal" aswell.This folder is full of text files you will read once you complete/begin a level to keep up with the story. a .txt file that says "story_number" is supposed to be read before you start that level.For example,read "story_09" before you start level 09.
a .txt file that says "story_numberB" is supposed to be read AFTER you complete that level! Example: you will read "story_09b" right after you complete level 09. You will have to play it in the Level Editor,by yourself,for the goals don't work in freeskate,and if you try to play online,every ped name turns to Quazz,which will end up making the story lack some sense.It is important for you to know who's giving you the message. Every goal in the level can be completed in any order,but once you reach for goals with people that have Red Names,make sure you've completed every other goal before.The red goals are supposed to be the last ones you complete in a level,and then advance to the other. Please look for the goals around the map,and not in the Goal Menu.Use it as a last resort if you're stuck,but remember,the maps are completely accessible.Be curious,explore them and look for the goals! Who knows what you might find. If you're having trouble,it is totally okay to edit a goal's score value or such.However,it will cost you the pride of completing it normally. You might notice the Beni Fingerflip in Skate-tricks or any other goals involving tricks.You need to do a Benihana and then press flip right after you do it.The configuration is incorrect in-game. Custom Tricks unfortunately won't work in Trick to the Beat,and those are all around the levels.It is either that or i'm just terrible at hitting my own trick to the beat.If that's the case to you,please configure to a normal trick and try again. If you find any game-breaking bug,please mention me in the THPSX discord and i will talk to you. I also want to thank everyone that supported me through the creation of this project.Thank you very much guys,It meant a lot to me and this was made in special to you all! Well,with that being said,i think that's all i have to do here.I hope you have fun with my little creation! THUGPro Custom Story Mode is out! UPDATE: Fixed the goal "Fast Combos! ",from Level 5. Yeah don't forget to upload the YouTube video of this in action!